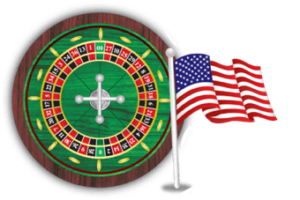 American Roulette is one of the most popular versions of the casino classic and not only in the US – but at casinos worldwide. Roulette actually started in France in the seventeenth century and was created by mathematician Blaise Pascal. The game is believed to have been introduced to the US by a Frenchman visiting New Orleans in the 19th century. The game that came to the US featured a single slot for the zero. However, casino owners quickly realized that adding another zero would make the house edge even bigger and this was quickly implemented. Some casino owners added another slot featuring an Eagle as an extra house slot, making the edge still higher. To make matters worse, in some cases this slot was larger than the rest – much to the annoyance of the average casino patron. Fortunately, American Roulette in the 21st century is a standard two zero game without an Eagle. You’ll find American Roulette in both land-based and online casinos. The US wheel features 38 slots –each numbered individually– featuring all numbers from 1 to 36 as well as the two zero slots, numbered 0 and 00. The two zero slots are opposite each other on the wheel and consecutive numbers such as 1, 2 and 23, 24 also face each other. The two zeros are colored green and the rest of the numbers will alternate from red to black as we go round the wheel. 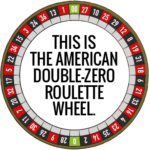 The simplicity of the roulette game is balanced by the possibility of making unique and often complex combinations of bets on the outcome of each spin. When first joining a table you’ll exchange cash for your roulette chips. Your chips will be of a different color to all of the other players’ at the table. This way the croupier can easily see who made the winning bets. When using these chips you’ll notice that the betting area is divided into two distinct sections – inside and outside bets. Inside betting refers to the bets you place on the individual numbers. Each bet can be on an individual number or a combination of numbers adjacent in some way. Straight – A straight (or single) bet is one on just one number, where you’ll be paid out at odds of 35 to 1 if you hit. Split – A split bet covers two numbers which you will place across the intersecting line between the numbers. The numbers have to be adjoining, and you can split either horizontally or vertically – examples being 4/5 and 17/20. This bet pays at 17 to 1. Street – This bet is on one of the rows of three numbers. You’ll place the chip on the edge of the line of a number at the end of the row. This bet pays at odds of 11 to 1. Corner – This is a bet on four numbers in a square layout on the betting area. You’ll place the chips on the intersection between the four numbers, so the chip lies partially in all four squares. This bet pays out at odds of 8 to 1. Top Line – This bet is on 0, 00, 1, 2 and 3 and you’ll place the chip on the corner of 0 and 1, or the corner of 00 and 3. This bet pays out at odds of 6 to 1. Outside betting is when you place a bet on a group of numbers. You’ll find these ‘outside’ the ‘inside’ bets on the betting area. Red or Black – This is probably the most famous roulette bet of all and many patrons of a casino will play this bet exclusively. Correctly predicting whether it will land in red or black will pay out at even money. Odd or Even – Like red or black, this also pays out at even money. 1 to 18/19 to 36 – Here you’ll be betting on whether the ball lands in the lower or the higher 18 number range. Once again, this is an even money bet. Dozen Bets – You’ll be able to bet whether the ball lands in the 1-12, 13-24 or 25-36 slots. This bet pays out at odds of 2 to 1. Column Bets – You’ll receive odds of 2 to 1 again on this bet. This time, however, you’ll be betting on one of the columns on the betting area. Is there a strategy to win when you play American Roulette? When playing on an American roulette wheel, the house edge is 5.26%. This means that every time you place a bet at the table, the casino itself will expect to make a profit of 5.26%. These odds are not favorable in comparison to some other games. Particularly, European roulette where the house edge is a much lower 2.70%. Tip: When given the option, always choose to play European Roulette. These are some of our favorite online casinos at which to play American Roulette. Best Online Casino – Optimized for mobile, tablet and web play, Bovada’s American Roulette can be enjoyed while on the go. Play online for real money at Bovada. Bonus: Receive a $3,000 casino welcome bonus and get three 100% match bonuses. Best Live Dealer Casino – At BetOnline you can play American Roulette with a live dealer and select your own table limit (1–100, 5–500, or 25–5000). Best International Casino – Just load Betway’s American Roulette table and choose how much to bet on each spin. Newcomers and high rollers can play to their own limits.